The second annual Stony Lane Comedy Fundraiser is approaching quickly and there are only 3 days left to purchase tickets! 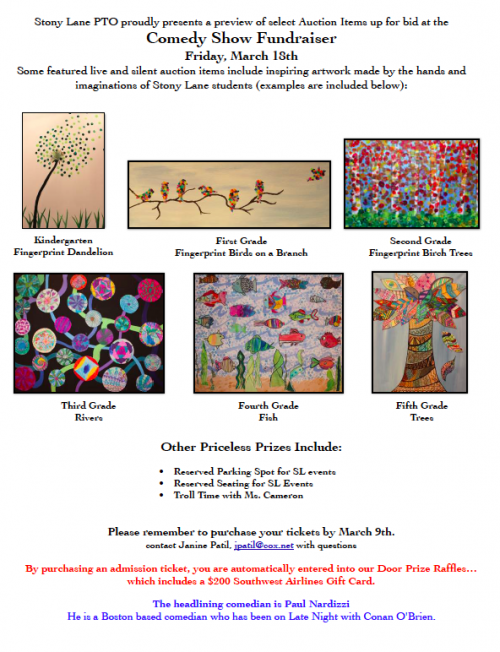 Your participation in this fundraiser provides crucial funding for the Math and Science Initiatives at Stony Lane. DreamBox is just one of the new programs we would like to be able to continue at Stony. It has been highly popular with teachers and students but it will need additional funding for it to continue through the next year. The proceeds from this fundraiser will also provide enhancements to the new classroom science kits. We recently purchased mini aquariums and aquatic creatures for the kindergarten classrooms. This was made possible, in part, due to the success of last year’s fundraiser. Please consider buying tickets and attending this very special event. It’s a fun night AND all of our students benefit from it. It’s a win-win!! Wednesday, March 9: LAST DAY TO BUY COMEDY FUNDRAISER TICKETS! Eat Healthy RI; wear green today. Keep sending in your spare change to support Pennies for Patients! Collection runs until March 18. ← This Week at Stony: Comedy Fundraiser, Pennies for Patients & much more! Is there a way to pay online via PayPal? Hi Christine! You can pay online through Square if you’d like but unfortunately we’re not using PayPal anymore. If you’re more comfortable sending in a check you can do so by sending it through backpack mail to Janine Patil. The check can be made out to Stony Lane PTO. Thanks!! See you at the fundraiser!